Apple's new second-generation AirPods are beginning to arrive to customers around the world, and some early adopters have turned to the MacRumors forums and social media to share their first impressions of the earphones. The new AirPods have the same outward design as the original and remain available in white only. Apple continues to include a one-meter Lightning to USB-A cable in the box with all second-generation AirPods. Powered by a new H1 chip, the new AirPods support hands-free Siri, enabling users to change songs, make phone calls, adjust the volume, get directions, and more by saying "Hey Siri." Siri can still be activated by doubling tapping one of the AirPods if enabled in Settings > Bluetooth on an iOS device. First impressions about the new Hey Siri functionality are mostly positive so far. MacRumors forum member Moxxham from Australia wrote that "Hey Siri seems to work really well," even with loud music playing in the background, while Reddit user Lachlanhunt found the feature "works reasonably well." First impressions about overall audio quality are both subjective and anecdotal, with conflicting opinions as to whether the new AirPods sound better than the original. Reports range from users not noticing any difference all the way to feeling like the new AirPods are a huge improvement for sound. When listening to music, I could not make out any discernible difference between my AirPods 2 and my wife’s original AirPods. I bought the AirPods 2 mainly for the gym and casual wireless listening. They will replace my Jabra’s which have lousy latency issues and fatigue my ears after 30 mins or so. Got new AirPods! Much better sound quality in FaceTime and Siri. Faster switching between devices. Worth upgrading from first gen only if your battery is dying. On a related note, Apple recently seeded a 6.3.2 firmware update for the first-generation AirPods, and some users on MacRumors and Reddit are speculating that the update has led to improved audio quality and faster connection speeds on the first-generation AirPods. Evidence is anecdotal at this point. Early adopters are also noticing that the new AirPods switch more quickly between devices like the iPhone, iPad, Apple Watch, and Mac they are connected. Apple says the H1 chip makes switching between sources up to two times faster. As far as battery life is concerned, more time will be needed for a proper comparison between the new AirPods and the original pair. Apple says the new AirPods get up to three hours of talk time per charge, compared to up to two hours with the previous generation. Other battery life stats remain the same, with up to five hours of listening time per charge and more than 24 hours of total battery life from extra charges stored in the case. 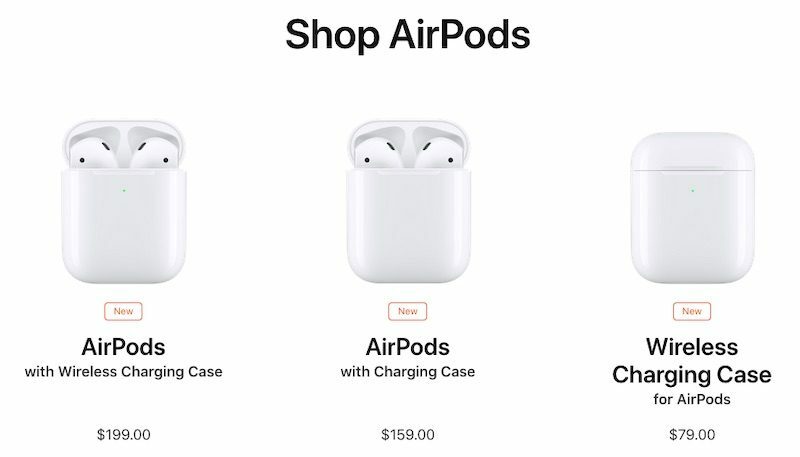 The new AirPods are available to order on Apple.com and in the Apple Store app with a wired charging case for $159, the same price as the original AirPods, and with a wireless charging case for $199. Apple says both options will be available at Apple Stores and select resellers starting this week. MacRumors will be sharing our own second-generation AirPods hands-on video and impressions soon. Let us know your own first impressions in the comments section or by tweeting at us with a @MacRumors mention! While I haven’t tried the new AirPods yet, I’m willing to bet all these people saying the sound is better just haven’t cleaned their gen 1s properly lol. Seriously...your ears can hear differently sometimes. I've experienced this with all earphones, headphones and the Airpods. Sometimes you can improve the sound by blowing your nose. It also depends on how much earwax is in there so yeah...it's subjective unless we see an actual scientific sound comparison. People want to believe when they buy the new model it's better than the old model so they convince themselves it's actually better, when in fact it's likely just the same. Why do people keep obsessing over "audio quality" in a bluetooth earphone? It sounds alright for out and about like every other earphone. I'll take the word of the people who hear the difference over the people who don't any day. There are people that think a 64 kbps mp3 sounds fine too. I’ll wait for the price to drop..
You’ll be waiting a very long time then. Probably a lot of new AirPods owners have old AirPods with 1-2 years of wax built up inside them. Legit the exact same in terms of sound quality, i mean cmon, its apple. they need a new "feature" for the real airpods 2.
still, mine arrive tomorrow since you can't unflush a pod. FWIW, I have a pair of original AirPods that I’ve never used, and the new ones sound noticeably better. The improvement is better than I expected. AppleInsider has a review that echos my opinion regarding the sound quality. Of course, haters are going to hate, and blame it on earwax.